Diode is a Scala/Scala.js library for managing immutable application state with unidirectional data flow. It is heavily influenced and inspired by Flux and Elm architectures, and libraries like Om and Redux. Diode helps you build applications that are easy to reason about, have predictable behaviour, are easy to test and debug and are type safe. It's a compact, high performing and extensible library with no external dependencies. Add following dependency declaration to your Scala project. "io.suzaku" %% "diode" % "1.1.3"
"io.suzaku" %%% "diode" % "1.1.3"
Core of an application using Diode is the immutable application model, typically represented as a hierarchy of case classes, storing the application's state. In our super simple example app the model contains a single value, the counter. Actions in Diode can be anything (that extends diode.Action trait or provides an ActionType[A] type class instance), but typically case classes work best due to their pattern matching capability. Application state is stored in a Circuit[M] which also takes care of all of the action handling. In your application you'd typically define a singleton object extending the Circuit. 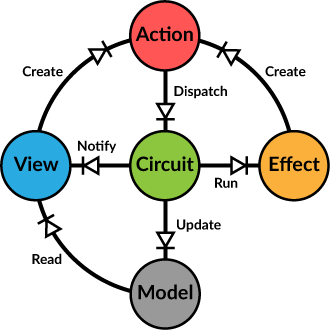 Your only responsibilities are to define the initialModel and actionHandler methods, everything else is taken care by Diode's Circuit. The actionHandler is a function receiving the current model and action and returning a result of type Option[ActionResult[M]]. Each action must return a new copy of the (root)model so we use the convenient case class copy function. Note that we are not updating the model variable here, just returning a copy. The actual update is performed by the Circuit. Because we want to keep the code clean and DRY, let's use the ActionHandler helper class to define our actions instead. Note how in the ActionHandler's constructor we zoom into the model, defining a reader/writer pair to access the part of the model these actions are interested in. This defines a scope for our handler, both preventing it from inadvertently accessing other parts of our application model and also simplifying access to the part we are interested in (provided through the value function). The class also provides helper functions like updated, making it trivial to perform model updates in our code. Finally we convert the ActionHandler into a handler function with composeHandlers. As its name implies, you can supply several handlers that are composed together to form a single handler function taking care of all your actions. To show our model to the user and to allow some interaction with it, we need a view. In this example we'll be building it using Scalatags, but typically you would be using some framework like React instead (for which diode-react provides convenient integration). The view receives a model reader to access the part of the model we are interested in and a Dispatcher to dispatch actions. Because we use a model reader instead of a direct counter value, we don't need to create a new instance of the view when the counter changes. The reader always returns an up-to-date value. If we had a more complex model, the reader would also allow us to zoom further into the model, to provide subviews only a partial model. For interaction we define three buttons for increasing, decreasing and resetting the counter. Clicking one of the buttons dispatches an appropriate action, to be handled by the counterHandler we defined before. In our main class we create an instance of the CounterView, granting it read-only access to the counter value in our model. Our application now has a model, it can change the model through actions and view the model in HTML. What is still missing is informing the view about changes to the model so that it knows when to redraw itself. For this the Circuit provides a subscription model, informing registered listeners whenever the model is updated. After subscribing to model updates we start the circuit by dispatching a Reset action. This will cause the model to update and the render to be called. Further updates due to user clicking the buttons are handled similarly. There are several example projects in the examples directory. First one is a simple application showing the basic use of Diode. The second example features a recursive tree view component with a couple of edit actions. Both examples use "plain HTML" without any framework like React. The third example is the traditional TodoMVC implemented with React on Diode. This example also demonstrates the use of Diode Dev Tools. The RAF example demonstrates the use of action processors to batch and render synchronized animations with requestAnimationFrame. A more complete application example is the Scala.js SPA tutorial, demonstrating the use of React integration features and async operations. Diode was created and is maintained by Otto Chrons - otto@chrons.me - Twitter: @ochrons. libraryDependencies += "io.suzaku" %%% "diode-react" % "1.1.2"